By Lisa C. Johnson of Anali’s Next Amendment. Kwanzaa and its seven principles gives us time to reflect on community. What does it mean to us? Many of us here at Kwanzaa Culinarians, including myself, don’t celebrate a traditional Kwanzaa. However, being part of this smaller community of food writers who are all part of the larger African Diaspora has been a wonderful experience. It has made me more mindful of the idea of community and what community means to me personally. The principle of Kujichagulia, meaning Self-Determination, focuses on speaking for yourself and making choices that benefit the community. When I think about my very first community, family comes to mind. Which is probably the same for most of us. When we’re born, our first protectors are our parents, grandparents, older siblings, aunts, uncles, cousins and longtime family friends. Then we grow up and go to school. We start playing sports and doing extracurricular activities and meet new people. We become part of different communities. We go away to college, then we start working. We may do volunteer work and find different hobbies that we like and enjoy with others. Communities can be formed in so many ways. If we’re lucky, we’re members of a wide range of communities over our lifetime. And this is no trivial matter. It’s crucial for survival. Social connection is key for our happiness and well-being. Community helps us as individuals feel stronger because we are part of something larger than ourselves. Maybe we might dare to dream a little bigger, because we feel some safety knowing that there are people who have our back. We have some protection to catch us if we fall or if we are in danger. 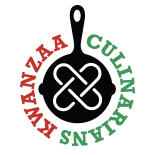 Looking back, this community here at Kwanzaa Culinarians was created by Sanura in 2011, a year after many of us spoke out against a commercial by a major food brand. We as writers of African descent felt that the advertising was racist and brought up the same old stereotypes that we are forever fighting against. It was a dangerous threat against us. Not physical danger, but dangerous ideas being put out into society. It felt good that I was not the only one writing about this issue and could support others who were speaking out too. We had become a community. Similarly, over the past year, we all have become aware of the Black Lives Matter movement – a community of young people and others who are fighting for justice for the victims of racial violence. We are all more cognizant of the racism that persists along with violence against black people. It seems that every day, there is a new video showing a beating, a shooting or even a murder. It can seem overwhelming at times and I find that I cannot watch every video. While I want to be aware and stay informed, I also have to protect my psyche. I felt guilty at first, but then I saw a “conversation” on Twitter about this very issue. Others were discussing the need to balance our “intake” of violence against us. We need to balance our awareness with time for self-care. Balancing our intake of what we watch is similar to balancing the food that we put into our bodies. It’s necessary for our well-being. We may not get it right every day, but we can try. I have a sweet tooth, but I try to balance it with healthy eating too. Frozen puff pastry has recently become a staple in my kitchen. It’s inexpensive and quick and can be used for a savory meal or a dessert. Or as I have recently found, for breakfast with a favorite fruit. Apples and pears are my usual choices in the fall and winter. When I made this breakfast treat, I didn’t measure any ingredients, because it was so simple. Prepare your puff pastry as directed on the package or do what I did. Let it defrost, or quickly microwave it, so you can unfold it. Turn the edges up a bit. Bake the pastry for about 20 minutes at 425 degrees or until puffed up and a little browned. Use lightly flavored fruit preserves to generously spread over the puff pastry. I used peach preserves. Cut up 2 -3 pieces of fruit in even slices leaving the skin on. Arrange the fruit slices on the preserve covered pastry. Pour a few teaspoons of vanilla extract over the fruit. Sprinkled the top with ground cinnamon. Sprinkle the top with powdered sugar. Bake for another 15 -20 minutes at 425 degrees. Let cool for a few minutes, before serving. I enjoyed this with juice, soy sausage and coffee. It’s not a bad way to start your day. Happy Kwanzaa & Happy New Year! Lisa C. Johnson is a food blogger, writer and attorney based in Quincy, Massachusetts. She blogs at Anali’s Next Amendment and is a contributing writer at Craving Boston. This entry was posted on December 27, 2015 by Lisa Johnson in 2015, Kujichagulia, Recipe and tagged Anali's First Amendment, Balance, Black Lives Matter, Fruit Puff Pastry, Fruit Tart, Kujichagulia, Kwanzaa Culinarians 2015, Lisa Johnson.